Based on reviews from 12 experts and 620 users. Learn how our rankings work or see our guide to Nike Phantom Vision football boots. Updated Apr 2019. Entering the football boot arena in July 2018, the Nike Phantom Vision is the lineup that replaced the Nike Magista football boot series. With the Raised on Concrete pack as the debut colorway, it is a surprise that Nike has chosen a rather toned down and understated colors to launch the series. It comes with a light grey almost white upper with darker shades of gray in key areas such as the Dynamic Fit collar and the soleplate. A stand out design for the football boot is the bright red triangle found on the medial side. Precision, instinct, and vision are taken into consideration during the design process of the Nike Phantom Vision series. Despite having several features that are similar to the speed-focused Magistas, Nike Phantom Vision football boots are focused on providing the ultimate control and comfort. Since it was released, these football boots have stirred the curiosity of fans everywhere. Not only because of its eye-catching design, but more so for having features that were never seen in any other football boots from Nike before. Phil Woodman, the designer of the Nike Phantom Vision football boot silo, wanted to create something different from the other football boots in the market. So, he conceived the Phantom Vision from the inside out. The Quadfit mesh is a proprietary construction that debuted in Nike football boots. Eventually, this feature will soon be adopted in other Nike shoes. It has four axes of fibers that not only conforms to the shape of the boot but supports it in all directions as well. Likewise, the gaps between the fibers distribute the load and mitigate the friction on the foot. With the Quadfit inside, the Nike Phantom Vision football boot provides a customized fit for a broad spectrum of foot widths and structures. Although it adapts to any foot shape, the material used on the Quadfit mesh retains its shape without overstretching. The Quadfit technology decreases break-in time to almost none because the material used molds instantly to the natural curves of the foot. The aptly named Ghost Lacing System is a definite improvement from the traditional laces. With its six lace loops, the touchpoints were minimized to create a one-pull construction. The loops are arranged in a V-shape to ensure balanced tightness and equal tension around the foot. The Ghost Lacing System was created in response to several player feedback. They opted to have actual laces for the sake of adjustability and optimal lockdown. At first glance, the concealed lacing system looks like a copy of the Adidas X 17+ Purespeed. But the Flyknit upper of the Nike Phantom Vision football boot is thinner and has more grip compared to its Adidas counterpart. The Quadfit mesh and the Ghost Lacing System are creatively tucked under the highly textured, paper-thin Flyknit upper. By doing so, the Nike Phantom Vision football boot effectively hits two birds with one stone. It provides a clean striking surface while also offering the ultimate lockdown and fit. The triangular textures on the surface of the Flyknit allow the Nike Phantom Vision football boot to have premium touch and control on the ball. They are denser in the medial triangle compared to the rest of the shoe. Flyknit is also used on the upper of the Nike Hypervenom Phantom III Elite DF Firm Ground and Nike Mercurial Superfly V Firm Ground. Nikeskin is a complex technology used in high-end, synthetic Nike football boots. It is a breathable mesh layer that is coated with a polyurethane film and treated with All Conditions Control (ACC). Aside from Nike Phantom Vision football boots, Nikeskin is also used on Nike Hypervenom and Nike Mercurial Vapor football boots. Another notable feature on a Nike Phantom Vision football boot is the medial triangle. It covers three prominent bones of the foot, namely the calcaneus, talus, and first metatarsal head. Based on the NSRL (Nike Sport Research Lab) data, this is the most critical area for maximum ball control. Thus, it is the area with the most grip. Also, with the help of the ACC, the Nike Phantom Vision football boot provides a consistent level of grip no matter the weather condition. The Nike ACC is similar to Adidas’ Non Stop Grip (NSG) found on the Adidas Predator 18.1 FG, Adidas Nemeziz 17+ 360 Agility FG, and other high-end Adidas football boots. Similar to the Nike Mercurial Superfly football boots, the Dynamic Fit collar found on the Nike Phantom Vision Elite Dynamic Fit Firm Ground is made of a soft and stretchy knit material. It provides a seamless transition from the boot to the lower leg, while at the same time allowing the ankle enough freedom of movement. 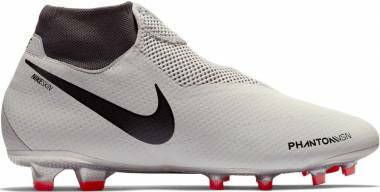 Other Nike football boots with the Dynamic Fit collar include the Nike Magista Obra II DF Elite Firm Ground and the Nike Mercurial Veloce III Dynamic Fit Firm Ground. As the name implies, the Anti-Clog Traction technology was created to prevent mud from clogging the soleplate. This is used on several Nike soft ground (SG) football boots including the Nike Premier II Anti-Clog Traction SG-Pro and Nike Hypervenom Phantom III Elite DF SG-Pro Anti-Clog. This innovation was developed over the course of two years and have been tested on players all over the world. The soleplate is coated with a hydrophilic polymer that is compliant when exposed to water. A limited edition Nike Phantom Vision football boot was released on August 14, 2018. It is so limited that there are only 1,000 pairs available worldwide with each pair being individually numbered. The numbers are engraved on the soleplate underneath the heel. The Nike Phantom Vision Gold has a predominantly white upper with black and metallic gold details. This football boot has a gold soleplate, medial triangle, and Nike Swoosh border. The outsole was dipped in liquid gold for a stunning finish. The white, gold and black color combination will most likely bring into remembrance another limited edition Nike football boot - the Nike Mercurial Vapor IX CR7 Special Edition, which was released in 2014. Which famous football athlete wore Nike Phantom Vision football boots? Kevin De Bruyne, Philippe Coutinho, and Leon Goretzka are among the popular footballers who were seen wearing Nike Phantom Vision football boots. Which Nike Phantom Vision football boot can be worn on firm grounds? The Nike Phantom Vision Elite DF Firm Ground and Nike Phantom Vision Pro DF Firm Ground are used exclusively on firm grounds (FG) only. While the Nike Phantom Vision Academy DF MG and Nike Phantom Vision Club MG can be worn on both firm ground and artificial grass (AG) surfaces. Are there indoor variations for the Nike Phantom Vision football boots? 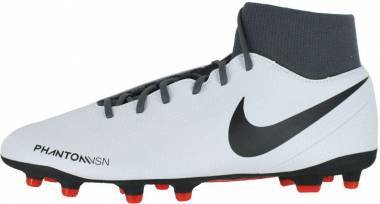 There are Nike Phantom Vision football boots for both turf fields (TF) and indoor courts (IC). These are the Nike Phantom Vision Academy DF TF, Nike Phantom Vision Club DF TF, Nike Phantom Vision Academy DF IC, and Nike Phantom Vision Club DF IC. Aside from the Raised on Concrete pack, what other colorways are available for the Nike Phantom Vision football boots? The Nike Phantom Vision football boots are also available in the Stealth Ops and the Rising Fire (Young Blood) colorways. The Stealth Ops comes in all black while the Rising Fire features the Team Red/Dark Grey/Bright Crimson combination. The Rising Fire colorway is also available in the Nike Mercurial Vapor and Nike Premier football boots. Are there Phantom Vision football boots for kids? Kids who want to don a pair of Nike Phantom Vision football boots on the pitch may go for the Nike Jr. Phantom Vision Elite DF Multi-Ground and the Nike Jr. Phantom Vision Academy DF Multi-Ground. Indoor and turf variations are also available for kids. What are the playing positions that are recommended to wear the Nike Phantom Vision football boots? This football boot, especially the soleplate, is made with attacking playmakers in mind. But specifically, the Nike Phantom Vision football boot is best for players who like to be quick on the pitch. Can players with wide foot wear the Nike Phantom Vision football boots? The Nike Phantom football boot has a slightly narrower last compared to its Magista predecessor. Therefore, it is not recommended for players who have excessively wide feet.